Meal planning can be intimidating if you’ve never done it before. When I first started meal planning I pretty much just winged it. However, there are a lot of great meal planning tips out there that can save you hundreds of dollars just by meal planning correctly. Here are just a few tips for meal planning that will help you to plan more efficiently, effectively, and save you tons of money every week! Listen up, because this is one of the meal planning tips that saves me the most money every week. Before you sit down and make a meal plan based on what you WANT to eat, first take stock of what you already have. How much food do you think you waste each week? And I’m not just talking about those leftovers that go to waste. How much food gets wasted because it goes bad before you can use it? I know in our family that used to be a lot. In fact, we still have weeks where that happens. But far less since I took the Grocery Budget Bootcamp eCourse (more on that later). One of the best things you can do to waste less food and money is to make meal plans based on what is already in your pantry. Have a lot of pasta? Find some pasta dishes you can make. Have some veggies that are going bad soon? Put a menu plan into place to use them before they spoil. Having this mindset on a regular basis will greatly reduce your grocery bill and will keep the food in your house from going to waste. The next way to meal plan is to plan based on weekly sales. The reason for this is so that you can save the most amount of money possible. So, as an example, let’s say ground beef is on a great sale. Instead of picking recipes that use chicken breast, make more recipes that week that use ground beef. It’s also a good idea to stock up when it’s a really good price too. This is a great time to substitute as well. If you have a recipe that calls for a certain veggie, but something else is on sale that you can substitute, go ahead and do that now to save some money. The best time to buy fruits and veggies is when they’re in season. If you buy them out of season then you’ll be paying a premium for them. Keep a list of what’s in season throughout the year and then build your menu plan around that list. If cabbage is in season then it’s time to break out your cabbage rolls recipe. If apples are in season then it’s time to make an apple pie. Enjoy your favorite fruits and veggies when the’re in season so they will be cheaper and taste better too. The key to having a backup plan is is to have a running list of staple meals that you can turn to when you need it. I find that it’s a good idea to have several different kinds of staple meals. Some that use the Instant Pot, some that use the Crock Pot, etc. Have some that are chicken based, and beef based, and even those that are vegetarian. You get the idea. Have a variety of ideas for meals that your family loves and you typically have the ingredients on hand for. The reason for this is that life gets in the way sometimes and you don’t want to find yourself stuck with either eating out or eating nothing. So instead, have go-to meals that you can whip up at the last minute if plans change. Be flexible with your meal plans so that you can move things around if needed and be ready in case nothing on your original plan will not work for a particular night. I honestly can’t imagine what meal planning would look like without my favorite meal planning tools. There are so many great resources out there to make meal planning more effective and quicker. Here are just a few that I recommend. My absolute favorite goto meal planning tool is PlanToEat. I’ve been using this for many years now and it’s a win-win-win in my book. What I love about it is that you can import recipes from all over the web, you can add your own recipes, you can edit them to your liking, and you can change portions, etc. Then you can either print out your recipes or you can use them straight from within the website. In addition to managing recipes and menu planning, it also has an easy to use shopping list feature. So you can plan your menu, then automatically build your shopping list based on what’s on your menu for the week. Then you can add additional items to your shopping list if needed. I then open up the shopping list while at the store and check items off as I go. I even add items to my shopping list from my phone throughout the week as I remember them. It’s great. Click here to check out PlanToEat today. They have a great free trial you can use to see if you like it first. 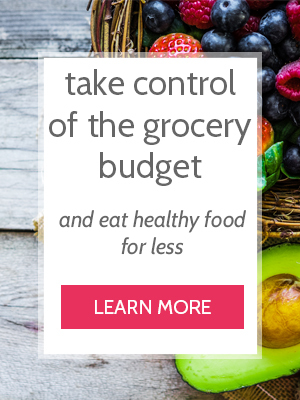 I also have to mention my favorite grocery budget eCourse out there. After taking Grocery Budget Bootcamp it drastically changed the way I shop and meal plan. I’m not even kidding you, this course taught me so much about saving money at the grocery store. It’s such a thorough and in depth course. We have pretty much cut our grocery bill in half every week since taking this course. She also has a big module on meal planning correctly and it taught me so much! So if you’re interested in learning more about that and about saving tons of money without sacrificing the quality of food (and without couponing 24/7) then you’ve got to check out the course. It only opens up a few times a year, but you can add yourself to the waiting list so that you don’t miss out on the next open enrollment! You can do this! And it will make such a huge difference in your life: from your finances to the way you eat. It’s a game changer. But it is a skill and you will get better with practice. Just keep on trying new things until you find a system that works just for you and your family. What meal planning tools do you find works best for you? Share in the comments below, I’d love to hear about them!